Between weddings, visitors and enjoying family, Alaskans’ vacation time can get spoken for pretty quickly. But summer moves fast in Alaska, and it’s easy to blink and find that it’s nearly over. Many Alaskans have a roster of tricks up their sleeves to squeeze the most out of summertime – whether it’s a go-to camping spot when a busy weekend opens up or a secret fishing location to drive to after work. We’ve got another one to stick in your back pocket today: the yurts with a view at Orca Island Cabins. 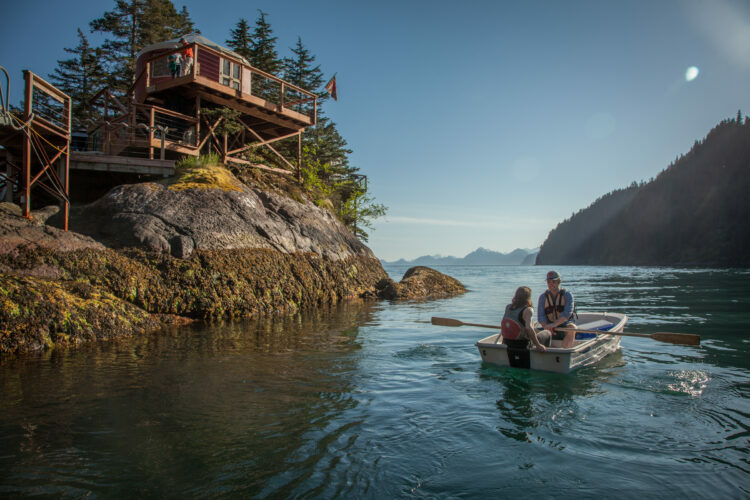 When you have limited time for vacation but still want maximum adventure, look no further than Orca Island Cabins. Take off as little as one or two days on one side of the weekend and you’ll still be treated to the trip of a lifetime. Craving relaxation? Spend your evenings sipping wine by our outdoor campfires or watching the midnight sun set on our magnificent open-air deck overlooking Resurrection Bay. Bring that book you’ve been trying to carve out time to read, or simply peruse the Orca Island Gallery. However much (or little) you pack into your day is up to you. Hungry for some summer fun? From Orca Island Cabins you can access hiking trails in the cove, including the historic Jeep Trail that was established during World War II to access a mountaintop military base. Sea kayak around the scenic and protected Humpy Cove, famous for frequent sea life sightings or explore the island’s intertidal zone via stand up paddleboard. With open dates through mid-September, there’s still time to book your most unforgettable weekend of the summer.